It is that time of year again. The weather is warming up and the spring marathons and half marathons are starting. Before I had William I ran 1 marathon and then lots of half marathons. I really like the half marathon distance, because I could train, but it wasn't nearly as stressful or take up as much time as training for a marathon. That 13.1 miles is such a great distance. I haven't competed in a half marathon or even run 13.1 miles since before I was pregnant. That race as back in October of 2015. I then got pregnant and realized I was pregnant in spring of 2016. At that point in time, I did not feel well enough to run 13.1 miles for fun. It would have been torture. I didn't sign up to run any races in 2016. I continued to run and work out at the gym until the week William was born (December 23, 2016). I took 6 weeks off running completely after William was born. I started back running and even did some PT to help with my pelvic floor. Through out 2017 I didn't run competitively in any half marathon races. I did ran a couple 5Ks and other < 6 mile races at the end of 2017. Now in 2018, I made the goal to run 2 half marathons (one in the spring and one in the fall). I want to get back into competitively running, but at this point in time I don't have the time to train for a full marathon. So that half marathon distance seems like the perfect compromise. Finding time to fit in long runs can be challenging. Thankful, William does really well in the running stroller. He has logged lots of miles in that stroller. He is a great running buddy. The timing of runs can be tough. Sometimes during the week, I just fit in 30 minutes on the treadmill at the gym before picking up William, because that is all the time I have to give to training. On the weekends is when I fit in long runs. I prefer doing my long runs outside. I will fit in a long run on either Saturday or Sunday and then try to pair a recovery run on the other day. That doesn't always happen though. I have been trying really hard not to push myself too much. I enjoy running and it is a stress reliever. It is easy though to get caught up in the mileage and if you can't hit that distance one day you can really beat yourself up over it. There is so much that goes into me getting out and running. I have to take William with me and keep him occupied and then of course run. But I also have to try to get my work done quickly that day to fit in that run. I have been trying not to over think it or stress too much about it. It is suppose to be fun and that is important. Training schedule - If you have run a half marathon before then you have probably tried to follow a training schedule. I really liked this article from Runner's World about training and fueling for a half marathon. I haven't followed a strict schedule to prepare for this half marathon. I have run 9 half marathons, 1 marathon and countless 5K-6 mile races. I know how often I need to run during the week (4 days a week is a magic number for me) and then I need to do at least one long run (> 6miles). Before the half marathon, I need to do at least one 10 mile run. I have also have to stretch out and try to do yoga at least 1 time per week. This all worked well prior to having a baby, so we will see how it goes post-baby. 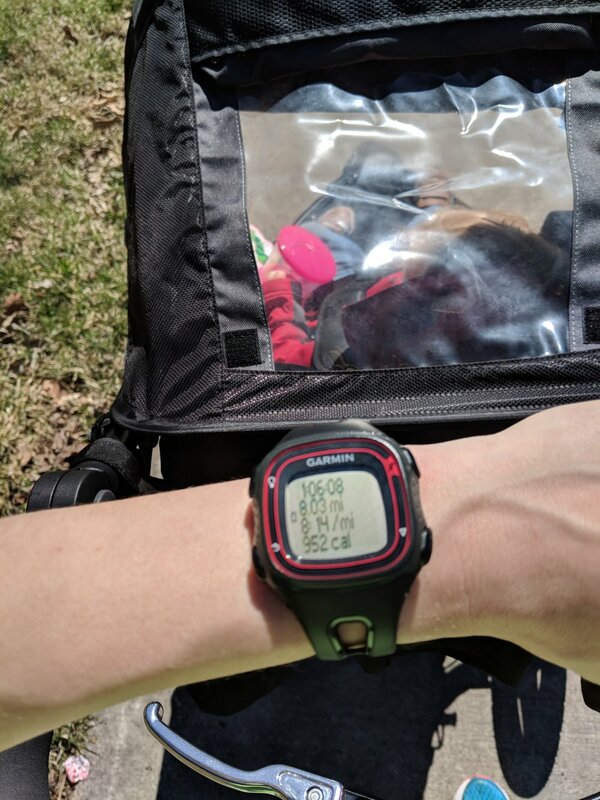 I have been running with a running stroller, so I feel like also includes some strength training in with those runs. Having a goal and working towards accomplishing it provides such satisfaction. I know that if I put in the miles (>20 miles per week) then I can get out there on race day and do well. I will keep you all posted on things go. My race is the Geist Half Marathon on May 19th. I have never ran on this course before, I know that there are lots of hills, so it will be a challenge. But I am looking forward to it! Confession time ... I haven't run in an official race since before William was born. It has been 10 1/2 months. I know ... that is crazy. I love running and I have been running since I got the all clear from my OB back in February, but I haven't run in an official, timed race from Thanksgiving of 2016. Whoa! Crazy right?! Believe me, I had high hopes. I wanted to run a half marathon in the spring, but that didn't happen because I couldn't find the time to train and I didn't feel like I was back to myself 100%. After getting from pelvic floor therapy, I feel like I am back to my pre-baby self and I thought about a fall half marathon. Will that time has come and gone. I wasn't able to get in enough mileage to run 13.1 miles in a healthy way. So here we are in November and it is almost time for Thanksgiving and the Drumstick Dash again. I have actually three races that I am signed up for in the next month. None of them are half marathons, but it is a start. They will be official races that are timed and needless to say ... I am so excited! SCOUTStrong 5K - November 11th at Camp Belzer in Indianapolis. I have been on the planning committee for this 5K for the past 2 years. Last year I ran in it pregnant. William did a great job (tagging along with me). It was a fun, beautiful fall course. Ran through the woods and this year it will go into Fort Benjamin Harrison. 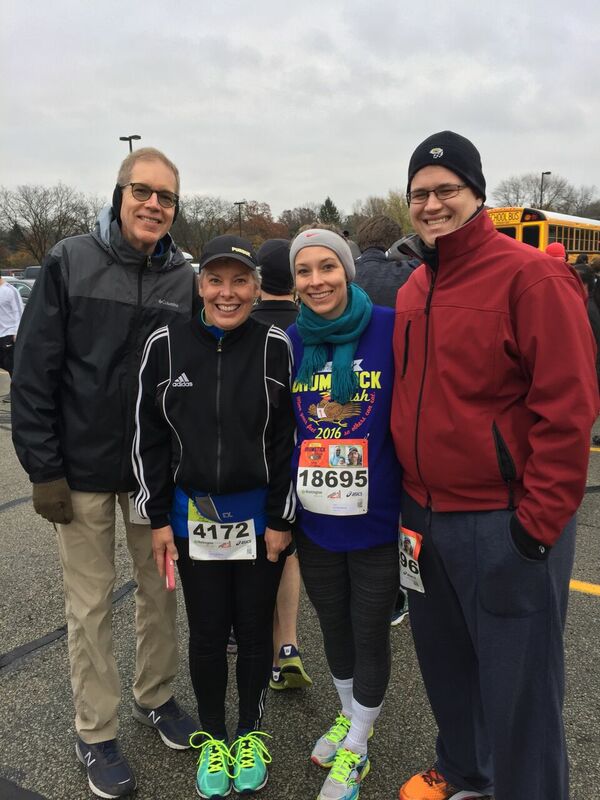 Drumstick Dash - November 21st in Broad Ripple. This is one of my favorite races every year. I have done this with my Mom for the past 4 years and this year will be #5! It is such a fun tradition and I love to feeling of being at the start line with SO many people. We have got to "move our feet, so others can eat!" Each year we have family do this with us and this year there will be 7 of us (William included). Hot Cider 5K - December 6th in downtown Indianapolis. I signed up to run this with a girlfriend, because there was going to be a fun thermal shirt and hot cider. Yes, please! I have done several races around the canal area downtown and it is fun. Goals for 2018 include running another half marathon. I think this upcoming year, I will bite the bullet and run the Indianapolis Mini Marathon. I know ... insert gasp here ... I have run LOTS of half marathons, but never the Indy Mini. I am thinking what better way to get back in the half marathon running habit then starting off with the biggest half marathon race in the country! I will have to start training in January of 2018. Should be a fun journey! I had the opportunity to attend a running safety seminar at Athletic Annex off of 86th Street in Indianapolis this past week. It was an evening program that was put on by Run Safer a business owned by Todd Williams (Olympic runner and Jiu Jitsu Black Belt. It was a great program and I am glad that I took the time to go. Lots of the things I was already aware of, but it was a great reminder and he had some wonderful tips on how to defend yourself, physically, from an attacker. WTHR did a segment on the event and I thought it was a nice summary of the program - CLICK HERE FOR THEIR VIDEO. If you want to watch the talk that Athletic Annex sponsored check out the video below! There was some great take away points from Todd's talk that I wanted to make sure to share. Always remember to be aware of your surrounds.This can make all the difference. I think lots of time attacks happen because people are not aware of what is happening around them. If you are running with headphones, keep the volume down so that you can hear what is happening around you. I liked the idea of running in a group or at least having someone aware of your running plans. Sometimes you don't have anyone to run with and just making sure that you have someone who is looking out for you at home can be helpful. There are apps/devices that you can use that can track your location, but if you don't have that, then make sure you are telling someone about your route and how long you will be gone. If you see some thing suspicious or makes you feel uncomfortable, report it. I think this a huge take away. If you run often, you have sense/feeling about things and sometimes things just don't feel right. So make sure that if you see some that makes you uncomfortable, call 911 and report that. This not only protects yourself but can always help to make sure a safer community. The last take away that I learned was about physically defending yourself. Use your legs (if you are knocked to the ground) and make sure that you strike vulnerable locations on the body (Head, neck, eyes, nose, and groin). Use your legs, elbows and hands. Be in a prepared stance and make sure you are facing your attacker to give you a better chance in a physical fight. Being aware of how to protect yourself is important for men and women. It also gives you confidence when you have a plan so that you aren't caught off guard if something were to happen. Hopefully this is helpful and has got you thinking about what you would do if you find yourself in a dangerous situation. I think having a plan helps to make sure that you are safe while you are out running. Stay safe! This past week I had the opportunity to talk to a group at Endurance House in Zionsville about nutrition. Endurance House had a 5K running group that were gearing up for the Zionsville 5K in June. The leader for the running group, Sarah Hill-Abel, was a friend from Lafayette. I had met her and worked with her at Tri-N-Run up in Lafayette for several years. Both her and I had moved to the greater Indianapolis area and I was excited to work with her again when she reached out to me a month ago. Since this running group was new to the whole running scene, I wanted to just touch on some of the basics of exercise and nutrition. Find snacks that you enjoy that pair a carbohydrate with a protein. This will help keep you feeling more full and will help to rebuild some of that muscle you broke down while exercise. It is best to have this protein after a work out and stick with carbohydrates prior to exercising. Bring your meal/snacks with you on the go (to work, while running errands, etc). This helps ensure that you are reaching for a healthy option. It removes the temptation to stop by the drive through or picking out something unhealthy from the grocery store. Have something to eat prior to working out. If it is in the morning, make that food item something light that you can easily tolerated (banana, granola bar, smoothie). Then add in some protein after the work out to help keep you feeling satisfied through lunch. Make sure that you have water with you. Water is going to be the best thing to use for refueling for any exercise taking < 60 minutes. Water is great because your body can easily use it and it is refreshing. If you are working out for > 60 minutes, then you can consider a sport beverage. This will provide carbohydrate and electrolytes, which are necessary to replenish after a long work out. There is water in foods that count as well. So drinking to thirst is a good way to know if you are hydrated. Don't stress about a "magical" 8 glasses as a day. Instead focus on making sure that you aren't feeling thirsty. Eating 3 meals a day with snacks is important and necessary when you are working out. We want to make sure that you are fueled properly so that you can complete the activity you want to do (running, walking, biking, etc). Making these meals/snacks healthier is key. Find ways to work in plenty of fruits and vegetables. Remember to fill your plate with at least 3 food groups to keep variety in your diet. You will quickly learn if there are foods that you need to avoid prior to exercising. If you eat and then wait 2-3 hours before exercising that is normally enough time to cause any GI distress. We had a great time talking about nutrition and hearing what this woman do currently to help them make healthier choices. Lots of time, being healthier and setting yourself up for success looks different for different people/families. If you hate cooking, then maybe you look to purchase pre-made food items from Whole Foods that have fresh vegetables already in those meal items. Maybe your buy your veggies cut up, because you know you would never spend the time doing that. Whatever helps you be successful in your diet journey, that is the key. Figure out what that is and try to make those chances so that you can be properly fueled for life and your upcoming run. No matter how slow ... you are out there running! I read a great article from Women's Running about the pace at which you run. I shared it on my Facebook Page and I thought it was good enough of a topic that I should write up a blog post about it. As many of you may know, I love to run. It was been a thing that I have enjoyed since I was a small child. It is just a part of who I am. I totally understand that those feelings (of enjoyment, delight, eager anticipation) may not be shared by you. In fact you may HATE running. The only time you might run is when you are running away from something that is going to kill you. That is ok. I am not offended that you may not LOVE one of my favorite pass times. I am not going to judge you. I will take some time and encourage you to find something that you enjoy doing that gets you moving, and keeps you active. Find whatever that is and set a goal for yourself and go after it! Now maybe a few of you reading this don't loathe running and you have always wanted to complete a race. You probably know lots of people who have run in races, gotten medals, and you think to yourself "if they can do it, surely I can too!" You are totally right! Starting with something do-able like a 5K (3.1 miles). You can run or walk and that is the best race distance to start off with if you are dipping your toe into the this new world of running. In fact the 5K is the most popular race distance! In the USA there have been 8.3 million 5K finishers. 58% of those finishers were women and 42% were men. Isn't that amazing?! If there are 8.3 million people able to run 3.1 miles ... guess what ... you can to! Now you might also be thinking "I am so slow, everyone will be passing me." If so, then so what! It doesn't matter. You are out there working hard, sweaty and moving yourself toward a goal. That is the important part and how long it takes you, means nothing. Lots of people feel self conscious when they run. That is totally normally and with time that feeling will slowly go away. Most of the time people, are not watching you and if they are, you should be proud of yourself that you are out there running as they sit in your car and just drive by. If you need some encouragement make sure to check out the Women's Running article about why running slow doesn't matter. It always makes me sad when people talk about running and then follow it up with the comment "well I am just slow" or they put themselves down. We need to stop doing that and take pride in the fact that we are out there exercising and trying to be the best versions of ourselves. If you need a training program help you accomplish your goal of running 3.1 miles then check out the Couch to 5K app on your smart phone. This is a great program to tell you exactly what to do to get yourself in shape to run in a safe way. So grab a buddy (a person or a dog), pick a goal and get yourself outside and moving! This is the time of year when everyone makes resolutions. You hear the phrase "New Year, New You!" That is true it is a new year and if you want to make a change, now is as good a time as any, but the big question is ... will your change stick?! For most people that answer is no! Instead of thinking about New Year's Resolutions ... I like the idea of New Year's Goals. What do you want to accomplish this year. Often I take a look at the calendar and I try to decide what type of races I want to participate in for the year. I look at when they are scheduled in the upcoming year and think through what training for those races might look like. I map out a plan of how I see myself accomplishing those races and then I sign up for them. Those same steps that I think through for races, can be applied to any goal that you might have. Determine the goal you want to achieve. Develop a time line or a game plan. Start looking at what changes you will have to make to reach that goal. What will your "training" schedule look like. Think about what obstacles might get in the way of your meeting that goal. Sign up or commit to that goal! Last year I completed my first marathon. It was tough, but I did great and I absolutely want to run another. I knew that I couldn't train for more than one in a year, because it took so much time and I kind of got burned out. I have decided that in 2016 - I want to run another marathon. I have decided that I want to run in the Mill Race Marathon in Columbus, IN. So what does look like? Well it starts with picking a race, determining a training schedule, building a strong strength training base and then logging lots of miles. I will keep you posted about my training plan. Set up will be sign up for the race and then plan how to do some strength training prior to the race training, which will start in May. I am looking forward to setting out to run another marathon in 2016! What goals do you have this year and how do you plan setting out to accomplish them? This past weekend marked the first marathon that I have ever run. This was a huge accomplishment for me because I had only dreamed of running a marathon and never thought was some I would actually do. Well on April 18th I made that far fetched dream a reality. It was a great day for a race. There were no clouds and lots of sunshine. The only issue was it started to get a little warm (mid 70s) which was a challenge because I had spent the whole winter training in frigid temperatures. I ran very consistently and honestly felt good. It got harder at the 22 mile mark and the course was a little more boring at that point, but thankfully I was able to power through for that last 4 miles. I am so blessed to have the ability to run and have this opportunity to compete. I finished in 3 hours and 46 minutes, which was great consider this was my first marathon ever. Since I am a dietitian I wanted to share with you some about my nutrition plan. I am firm believer in having a nutrition plan for your race (anything longer than 1 hour, you need to refuel). What you put in your body is very important. I have done race day nutrition presentations for local stores and I love talking about different endurance activity nutrition products (shameless plug, if you want me to come talk about nutrition and exercise send me an email via the CONTACT ME link). There are a ton of different products out there and the main take away message here is to find what works best for you. So here is what I use and why I have chosen these products. These Huma energy gels are made from chia seeds. The best part of the product is the fact that it doesn't contain malto-dextrin (which is a type of carbohydrate that can cause some people GI distress). The texture is nice as well. Unlike a gel, it is more the texture of applesauce, slightly chunky due to the chia seeds.The flavors are all fantastic. If you have had issues tolerating a gel product then I would encourage you to try Huma and I am sure that you will be hooked! I like using Salt Sticks, because I normally don't drink a carbohydrate/electrolyte solution when I run. For some reason I have had issues tolerating some like a Gatorade product. I do better with plain water and then I take the Salt Sticks to help make sure I am replacing the electrolytes that I have lost from exercising. I typically take 1 every 45-60 minutes when doing endurance activity. It works well and I have found it helpful when doing endurance activity. As mentioned above, I normally drink water. I carry water with me when I run to help make sure that I am staying hydrated. I didn't use to do this, but I have learned that I feel better if I take water with me when I am out for > 60 minutes. I use the Nathan hand held water bottle. I love it. It holds 18oz and during my marathon I used two. I carried one with me for 12 miles and then I picked up a new one (filled with cold water) and carried that through the end. I did end up using the water stations starting at about mile 20 because I was starting to run low on the water I was carrying with me. I received no compensation for my views on any of these products. This was my personal experience. These are recommendations, but results will vary from person to person. If you have specific nutrition related questions, please feel free to reach out to me via the CONTACT ME link above. I am on week #16 of my marathon training schedule and on Saturday (April 18th) I will be running my first marathon ever. I posted back at the beginning of March about how I was water jogging. If you missed out - check of that blog post HERE. I made an effort each week to get to the pool twice a week and water jog for 60 minutes. It has been a fantastic experience. I have been so thankful for that opportunity and I think it has helped with my recovery after long runs. I never thought that I would be getting ready a marathon. I have run 7 half marathons over the past 5 years. I started with a half marathon in Illinois after working at NIFS (National Institute for Fitness and Sport) and was inspired by my boss who was an iron man competitor. I thought I could run 13 miles. Up until that point I had never really run over 8 miles. After that first half I started to get hooked. Then in 2014 I decided that I wanted to try to do a marathon. My goal was to run a marathon in November of 2014, but that didn't happen. I was kind of disappointed, but decided I should do 26.2 miles before I turn 27 years old (at the end of April). So on Saturday I will complete my first marathon - 26.2 miles while 26 years old. I never imagined that 5 years ago when I ran my first half marathon I would be running a marathon in the future. August 2010 - Very first Half Marathon in Illinois with my sister Ivana. It has been an amazing learning experience in discipline. I trained the entire time outside. I don't belong to a gym and I had to run outside. In the rain, snow and ice. There were a lot of firsts for me - first time running in sub-zero weather, first time running over 13.1 miles and first time running for more than 2 hours. If you have ever wanted to run and thought about a marathon. You should do it! It is challenging and there were days I didn't eagerly anticipate my cold run outside, but it was worth it every single time. Looking forward to Saturday and rocking out 26.2 miles! Some of you may know this, but I love to run. In fact I have been training for a marathon for the past 9 weeks. My first marathon every and I am super exciting and yes slightly terrified. Well after my 16 mile run last weekend I started to experience some knee pain. I knew right away what was going on .... runner's knee. This is an inflammatory condition of the muscles surrounding the patella that is due to weak quadriceps muscles/hip muscles, poor running form, bad shoes or over use. Well I knew that if I didn't change up my routine then this pain was going to persist and get worse. I did end up running 5 miles on Monday, but I ended up walking some, because I didn't want to push too hard. From Tuesday through Thursday I took time off. I spent Wednesday evening doing hip strengthening exercises for an hour. Then Friday morning I went water jogging. I found a community swim time at the Zionsville High school and headed over there to run in their deep end of the pool for 60 minutes. It was quite the work out and I think I am going to work water jogging into my routine.